A well-intentioned, emotionally charged yet historically questionable passion project from Oscar winning filmmaker Costa-Gavras that’s been roughly forty years in the making, Amen. takes you on a behind-the-scenes journey of what should’ve been naturally engrossing terrain. Hoping to investigate the question of who knew what, when and why more wasn’t done to stop the “Final Solution” that led to the mass execution of Jews during the Holocaust, Amen. initially resonates with viewers on a humanistic level. Unfortunately, as the film continues the admirable motives of the piece get bungled by leisurely pacing, static editing and an overreliance on manipulatively manufactured melodrama to try and make points when understated simplicity would’ve been far more effective in driving the moral subtext home. Based on Rolf Hochhuth’s divisive 1963 play The Deputy, a Christian Tragedy which was criticized by those from all nationalities and religious walks of life for the artistic liberties that were taken with real figures and events surrounding the horrific genocide that occurred during the second world war, Amen. confronts the controversies inherent in Hocchuth’s text head-on. 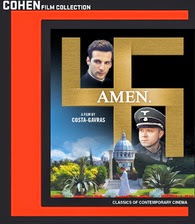 Adapted by Costa-Gavras as well as Jean-Claude Grumberg, the audacious script raises valid (if contrived) questions about the culpability of other leaders by daring to make the government officials of other countries and various organizations – most notably the Catholic Church and Pope Pius XII in particular – accessories to the crimes that occurred at the Nazi Death Camps. Centered on a historical figure, the film revolves around the moral crisis faced by a hardworking German chemist named Kurt Gerstein (played by Ulrich Tukur) after he discovers that the vaccine that he’d created to provide a safe haven from typhus is instead being used in the form of a gas to murder men, women and children by the thousand. Hoping to alert the Vatican in order to put a stop to the horrific actions of the SS officers he has no choice but to work alongside for fear they’d slaughter his wife and children, Gerstein’s pleas to reach the pope fall on deaf ears. 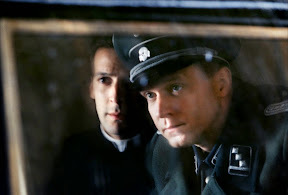 Finding an ally in a young Jesuit priest (played by Matthiew Kassovitz) who’s as passionate to stop the insanity as he is despite having no means or influence, the two men realize they cannot stand by while such atrocities are occurring nearby. 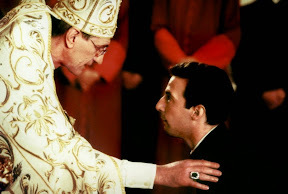 Needless to say, it’s easy to understand why the work riled up viewers for its shocking portrayal of the Catholic Church (and foreign governments) especially when you realize that portions of the plot in addition to the Jesuit priest character had been invented entirely out of thin air. 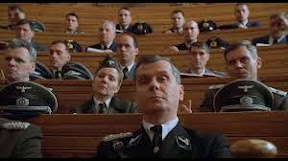 However after researching Gerstein out of curiosity in order to separate fact from fiction, I couldn’t understand why someone as drawn to political filmmaking as Costa-Gavras was had chosen to use the play as the basis of his film when the details available that chronicle Gerstein's real life are far more riveting on their own. As debated as the facts are surrounding the man in question via Gerstein’s own handwritten accounts, rather than relying on fiction to formulate a clumsily crafted and overly contrived final payoff in the film’s meandering final act, Costa-Gavras could’ve instead crafted an intriguing, investigate thesis worthy of Oliver Stone. The last film from the director to utilize an English language track to date, the rather heavily accented dialogue would’ve benefited from the inclusion of a subtitle option on this otherwise technically stellar high-definition Blu-ray that shows off the meticulous frame composition, production design and cinematographic quality for which a Costa-Gavras picture is known. Likewise it’s the technical specs of Amen. as well as the moving performances by our two leads that serve as the saving graces of this otherwise uneven production. Furthermore, just like subtitles would’ve heightened our understanding, another read-through of the onscreen text might’ve augmented the film overall. In a mind-boggling juxtaposition of pictures and words, Amen. illustrates one fate for our character and then uses a decidedly contradictory word choice moments later that makes us wonder if we either missed something, misunderstood some vital detail, or if the screen cards had been given an unsupervised translation after being written in a different language altogether. While any foreign film buff understands that typos are quite common, because Amen. 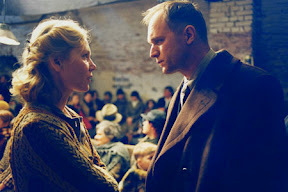 had been so structurally all over-the-place (not even clarifying the years when time flies by), ultimately we’re left with one awkward final impression of a film that attempted to reveal the truth about the final solution without understanding the importance of the final act in doing just that. Disappointingly underwhelming despite its original potential as a work so many decades in the making, Amen. will be of particular interest to devotees of Costa-Gavras, even if it’s a minor entry in an otherwise staggering career of major achievements (aside from the lukewarm reception of another WWII inspired effort via Music Box). The rest of us will do better to opt for one of several finely crafted, emotionally riveting and historically sound films that brought the horrors of the Holocaust to life for the current generation – whether by way of The Pianist or Schindler’s List.